I first started collecting Dept 56 houses back in 1985 when I saw the first ones at a JC Penney when I was living in Phoenix, AZ. The attraction was immediate and all I could think was how neat it would be to collect enough of them to have a snow village. But at $30 a piece they seemed too pricey so I passed on buying any. However, back in the day when everything for Christmas would go on sale for half price on the 26th, I went back and purchased whatever they had left. As more and more houses were added, "real estate" space started becoming more of a premium so I slowed the purchase of houses. But businesses, on the other hand, could be placed side-by-side so that part of the collection soon caught up. 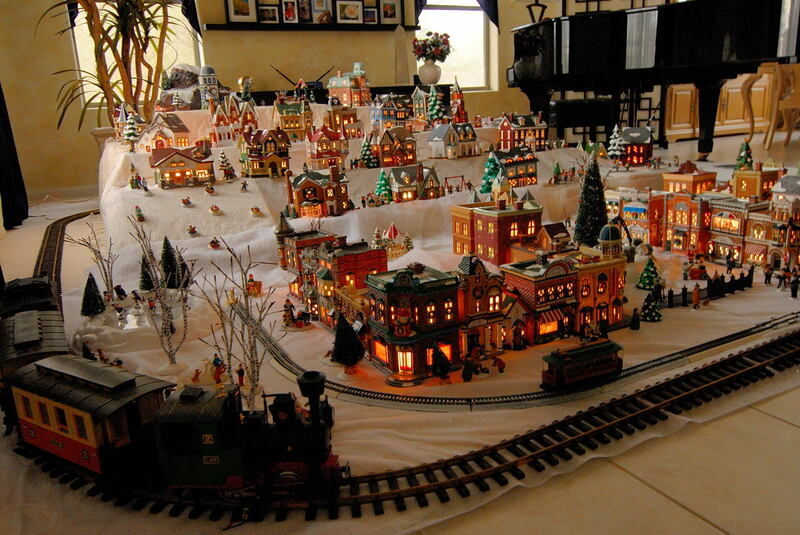 And necessarily every year the setup changed, but even in the years when I had purchased little, the layout would be whatever I felt both looked right and worked electrically. There is a maze of electrical wires beneath the setup. If you're wondering, I rely on an X-10 system to turn on and off the village as I use several electrical outlets. For the most part, the houses and business are part of Dept. 56's Snow Village collection. I have a number of Dicken's Village pieces, but I haven't displayed them for many years. But the figurines are another matter. Like many other collectors who build large villages, I find the figurines for the Snow Village completely out of scale. Some of these people are 15 feet tall! So I use the figurines of the other Dept. 56 collections which are actually made of porcelain. The scale is a much better fit. But I do not limit myself to genuine Dept 56 figurines. Many other collections have appeared with figurines in the same proportions. 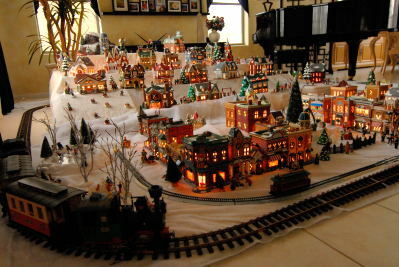 Pictures of various years of my Snow Village.